Sew Inspired: finally... finished baby quilt! I'm going to wash and dry it, get a label on it, and mail it to its owner right away! The quilting was done in sort of straight lines, some of them doubled up, in a grid. I thought I (pin) basted pretty well and I used my walking foot, but there were still some issues with the layers shifting as I quilted. I am looking for any suggestions or advice about improving my straight line quilting, because I am hoping to quilt my watercolor quilt next, and I was thinking (hoping) diagonal straight lines would be a good choice. Here's a better view of the block I put in the back. Blocks for a charity quilt that the bee beautiful group is collaborating on. And, jam. I made it with the quick set freezer method. My first time. Strawberries were on sale! I'm going to make another batch, probably in the morning. Things are working out a bit better here this week and I'm actually going to post my link over at sew -n- tell Friday. Go see what else people are sharing! Your quilt is pretty! How far apart are you pin basting? I am wondering if thats why it is shifting??? Cute little quilt, that back square is very cute. And your jam looks like heaven.... it's actually making my mouth water just to think about it! Love the finished baby quilt and strawberry freezer jam. 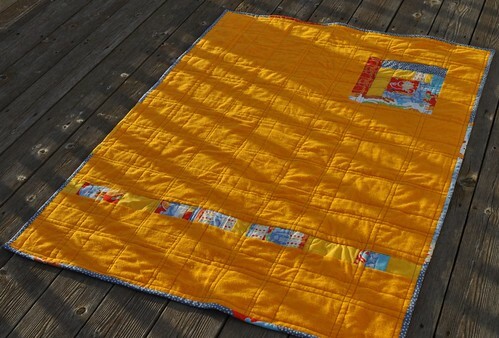 Have you tried the spray adhesive that helps keep the quilt together? I found some at Walmart, I might maybe try spraying and then pinning. What do I know though I am just a beginner! Nice finish! I love how it came out -- so bright and cheerful and I love the patchy back. You did a great job on it! Love the quilt! Did you use any pattern or instructions or just make it up from the top of your head? Would love to make something similar. After having a lot of shifting problems myself, I have converted to basting spray, the 505 brand sold at quilt shops. I swear by it now. On bigger quilts, I still so some pinning around the edges but on small ones, like this one perhaps, spraying is all I need. Awww! 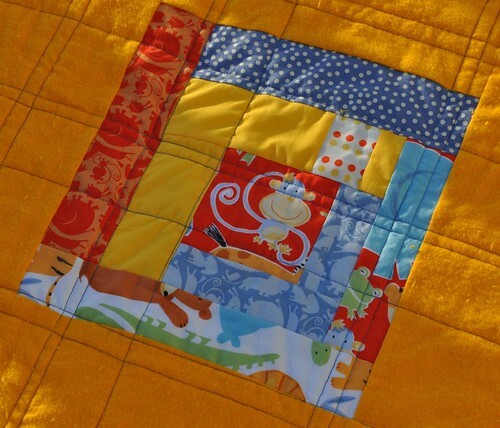 I love the colors and the MONKEY on the baby quilt! Great job! great finishes Vicki! I love the backing for your quilt. I haven't made jam for years. I should try your method. 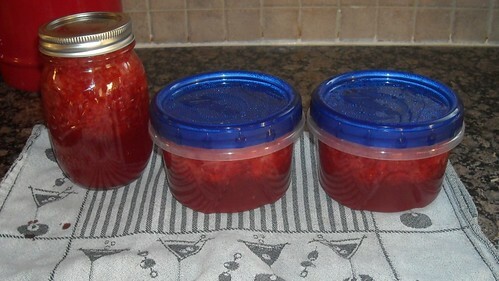 I love that quilt and plan on making some strawberry jam, too! thanks for the inspiration. As for the basting... I find that if I pin baste I have shifting issues no matter how close I pin. What I use is a temporary spray adhesive like 505. Have you tried it before? If not, I would recommend you try it. keep up the good work! Lovely! And skip the basting spray and go directly to fusible batting! Seriously! I LOVE your quilt! You did a great job on it. 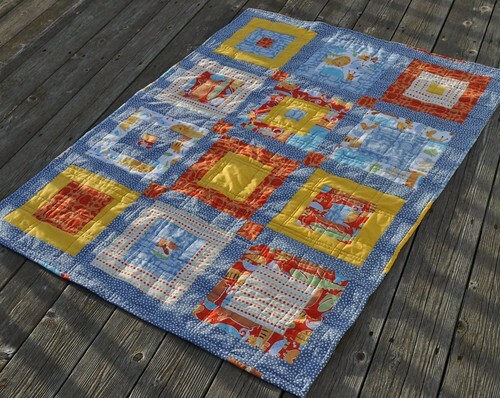 Love the finished quilt, lovely bright colour combo! Wish I could help you with the quilting but I have the same issues. Spray adhesive and pinning worked good for me last time I machine quilted a largish quilt. Absolutely darling. I have GOT to make freezer jam this year. What a gorgeous baby quilt. I love your colour choice. The star blocks are lovely. 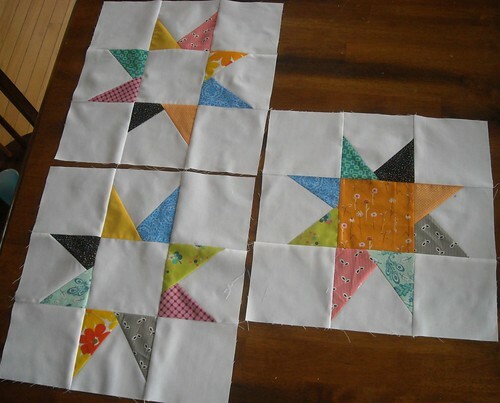 Its hard to beat a star block (or pinwheel) for that matter. What a very cool quilt. Those fabrics are perfect. I love the back of that quilt. Vicki, your baby quilt is beautiful! Love the bright colors and the monkey block. Your maverick stars are great as well. Thanks for sharing.